Traditional Maori bonecarving has become a carrier for cultural identity in todays New Zealand: These bonecarvings of Brian Flintoff were advertised in Air New Zealands “Skyshop Catalogue” 1998. Depicted are two Hei-Matau (stilised fish hooks, bottom), one Manaia (a bird-like mythical figure, left) and other motifs. More related in DAVIS 1994. 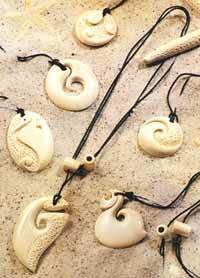 Stilised fish hooks are worn as pendants in whole Polynesia representing different styles from different archipels. The example at the right is known as Makau in Maui, Hawaii. It was manufactured by Lonita and Wilfried Heun from cattle bone.